Cups, the organic cupcake lounge in La Jolla is offering more that frosted goodness served to sweet beats. They are also hosting culinary classes in their gorgeous teaching kitchen. The ladies of Cups invited me to attend a class to get the lay of the land for the Raw Food Class I’ll be teaching there on May 21st. 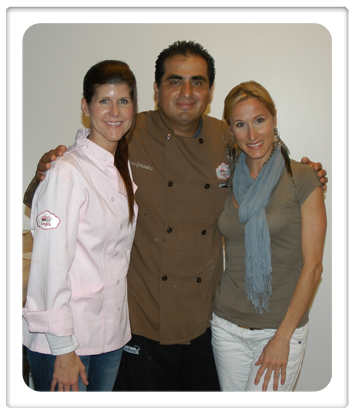 So, this past Saturday I went to the Gluten Free class led by Karen Fine of Mom Cooks Gluten Free and Jesus Gonzales the Chef and Culinary Director at Cups. Here is a sneak peak at the class. Be sure to log on to the Cups Culinary Calender now because if you register and pay for classes before the end of the year you save 15%. Find Karen’s recipe for the Pumpkin Cupcakes with Cinnamon Cream Cheese Frosting on her site along with other recipes and helpful tips on gluten free living. Delicious. Bake at 350 degree F for 20-30 minutes. This recipe frosts about one dozen cupcakes and 15 minutes to make. With an electric mixer, beat the butter and cream cheese together on high until fluffy. Spread or pipe on the cooled cupcakes. I attended the class as well – great time with great food. I have since made the pumpkin cupcakes and they were a huge success. I even hid some just for me!! Have you checked out Karen’s site for more recipes?? Good stuff. All the raw recieps I do are gluten free too, so you might want to check out Rocking Body Raw Food. It is a fun two week crash course in raw food with the benefits of an easy, yummy cleanse. All grains have gluten. I have Celiac disease and didn’t get better all the way because of all the so called gluten free flour substitutes. Coconut, almond, and sweet potato flour don’t have gluten. Beware, gluten free really means no wheat, barley, or rye gluten. Yes, rice, corn, quinoa, etc all have their own type of gluten which can still cause a problem especially if you have leaky gutt from years of undiagnoised gluten sensitivety or Celiac disease.